"What's different about Rosensteel Fleishman from those lawyers I see on TV or who sent me letters in the mail?" Our lawyers have been recognized by the Charlotte Mecklenburg County bar two years in a row for their outstanding service and results for their clients. Our focus is our clients not mass advertising. We provide personal attention to ensure our clients are not taken advantage of by insurance companies and we work to get the best possible compensation that our clients are entitled to. We even handle our clients' property damage claims, free of charge, so our clients can focus on their treatment. We purposely limit the number of cases we handle each year. This allows us to spend more time on each client's case. 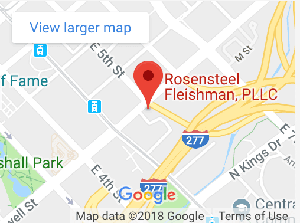 "How can Rosensteel Fleishman help me after a car accident?" When our attorneys agree to handle a Charlotte car accident we take the case with the expectation of handling it from beginning to end. This further means that we agree to take the case through trial, if necessary, to get our clients the best outcome. While there are dozens of lawyers who will handle a car accident case we suggest that you inquire as to which lawyers have experience in court fighting for their clients. We have found over the years that many times the attorneys who do the most advertising have the least amount of experience. We are selective about the cases we take on because this allows us to provide the best representation and achieve the greatest results. Our lawyers will sit down with you from day one to learn about you, your case, and your desired outcome. The same lawyer will work with you from the inception of your case through its conclusion. This level of service limits the number of car accident cases we can take on throughout the course of a year. However, this allows us to fully investigate and prosecute each case with the sole goal of achieving the best possible outcome. Unlike the majority of Charlotte personal injury lawyers we do not advertise our services. We choose to let our results and the community speak for us. "How soon should I contact Rosensteel Fleishman after a car accident?" Insurance carriers know the more time that passes after a car accident the harder it becomes to gather evidence as to the cause of the accident. This becomes important when you have two different stories about how the accident took place. A familiar situation is when two cars collide in an intersection and both drivers claim they had the green light. If there is a witness to the accident, that person’s statement needs to be secured as soon as possible. Claimants can not rely on their own insurance company or the adverse carrier to do this, especially if the witness would give a statement adverse to their insured's (and their) interests. As time passes memories fade, people move or pass away. Failure to secure the witnesses statement may result in a key piece of evidence being lost forever. Our lawyers have worked with dozens of engineers across North Carolina in a variety of car accident cases. An engineer is uniquely qualified to reconstruct the accident using physical evidence. After a reconstruction the engineer is in a position to provide testimony regarding how the accident took place. Many times our engineers can provide explanations as well as disprove defense claims. We have represented hundreds of individuals where their claim was denied prior to us becoming involved. Through the use of highly experienced engineers we have won millions of dollars for those same clients. To us, a denied case does not equate to an closed case. "Do I even need a lawyer since it is clear the other person is at fault?" The mistake many people make is assuming the other person's insurance company will pay for their medical treatment, lost wages and pain and suffering following an accident when it was clearly their insured's fault. This is a fundamental misunderstanding of how claims are handled in North Carolina. Keep in mind that insurance companies look to avoid payment, the less they pay the larger their profits at the end of the year. In most car accident cases there are two main issues, liability and damages. Liability looks at fault, i.e. who caused the accident. Damages looks at the injuries resulting from the accident, i.e. did the accident "cause" the injuries, lost wages, etc.. One of the most import aspects of a personal injury case is medical causation. In essence, this means proving that the accident caused the injury you are complaining of. Most cases that go to court in North Carolina are not dealing with who was at fault but whether the accident caused the injuries the Plaintiff is alleging. Insurance companies look for common mistakes people make following a car accident to get out of paying. One of the most common mistakes people make includes failing to tell their doctor all of their symptoms or waiting too long to go to the doctor after the accident. Since the burden of proof is on the claimant these mistakes allow the insurance carrier to argue a lack of causation, thereby avoiding payment. Many people wait to get treatment for their injuries until after speaking the insurance company and getting their "OK" to treat. This is a mistake for two reasons. First, you do not need the insurance company's permission to treat. Second, delaying your treatment benefits the insurance company as it allows them to argue lack of medical causation. As such, the longer they can delay you from treating the more they benefit. We will explain what you need to do to protect yourself from these and other common mistakes on your first phone call or meeting with our lawyers. The most important aspect of your case is your health. By focusing on your health you will benefit yourself two ways. First, you will get the best medical care. Second you will eliminate many of the issues insurance companies target when trying to reduce or eliminate the value of your case. "My wife and I were involved in an accident in March of 2013. We were hit while crossing an intersection and our car rolled onto its roof. We contacted Matt in the couple days after the incident and were very pleased with his counsel. He advised us on how to handle our situation and we were very pleased with the result after our case was settled. Additionally, his staff, particularly Tori, worked very hard on making sure we had transportation and that our property damage claim was handled appropriately. I recommend Matt to anyone who has been in an accident with bodily injury. He’ll make sure you’re matter is handled well and will make sure that you understand what is happening every step of the way." "Should I use my health insurance? Shouldn't the other person's car insurance be paying for my treatment?" In some states car insurance companies will pay for the ongoing medical treatment of the claimant. This is called third-party billing. North Carolina doesn't have third-party billing. North Carolina is a liability state. This means insurance companies only pay after the settlement of the case. Payment only occurs after insurance companies have determined that the medical treatment incurred was "caused" by the accident. This means individuals are on their own to secure and pay for their own medical treatment. We advise our clients to use their health insurance to gain access to medical providers. Of course, when you use health insurance that may create a subrogation claim by your health insurance company. Many people mistakenly settle their claim on their own following a car accident only to discover their health insurance company demanding the entire settlement for their subrogation claim, which would leave the individual with nothing. We handle our client's subrogation claims at not extra cost. We do this to protect our clients and make sure they are not taken advantage of. Many times, after due diligence, we learn that the health insurance companies are not entitled to subrogation. "I’m very pleased of the work Mr. Fleishman has done solving my Accident case, his dedication, professionalism, help and support during all time while my case resolved was excelling beyond the norm. My sincere gratitude goes to Matthew Fleishman for my excellent legal representation. Thank you very much for displaying experience and skill to get the best possible results for me. Sincerely Happy Client." "Should I at least call the insurance company and set up the claim?" In North Carolina you do not have a legal obligation to speak with the other person's insurance company. As a general rule we do not allow our clients to speak with insurance companies. Our client have nothing to gain and everything to lose. "What is going to be discussed at our initial meeting?" The primary focus during the initial meeting will be your health. We will make sure that your medial issues are being promptly addressed and that you are receiving the best care. Many times our clients will not be covered by health insurance. We work with doctors all over North Carolina, many of whom will see our clients even without insurance. We believe in being as candid with our clients as possible. We believe the only way to represent people is to be as clear and transparent with them as possible so that they can make the best decision for themselves. The first thing our lawyers will explain to you is that after being injured in a car accident you can bring a claim against the at-fault party's insurance carrier. From the point of view of the insurance carrier the value of the claim is dependent on how clear the liability is and the extent of the injury. In many situations the insurance carrier will attempt to reduce its exposure by arguing that their insured was not at fault, partially at fault, or that the car accident did not cause the injury claimed by the plaintiff/claimant. Our lawyers will explain what each defense means as well as the counterargument. "I was recommended to Rosensteel Fleishman by my doctor after a car accident. Both Matthew and his paralegal, Dawn, spent a lot of time educating me on the process and making me feel at ease with my decisions. I appreciated the personal feel and I would without a doubt use them again." "Will I get compensated for what I am going through?" Our lawyers work to find every possible source of money to compensate you for your personal injury. Our investigations include, but are not limited to, DMV insurance checks, asset checks, and private investigations. We make sure our personal injury clients are fully informed about the financial and legal aspects of their case every step of the way. In the ever changing landscape of NC personal injury law our lawyers have the experience and resources to get our clients everything the law says they deserve. Further, our lawyers handle all aspects of insurance subrogation, at no additional cost, to put more money in the pockets of our clients. After being injured in an automobile accident in North Carolina there are many things to worry about. You worry about your health, your family, your car, your job and your future. You should not have to worry about the credibility and expertise of your personal injury attorney. Each NC personal injury attorney routinely fields questions regarding auto accidents in Charlotte and throughout North Carolina. Some of the most frequently asked questions regarding NC car accidents have been addressed in the many articles found on this website. Many clients who have experience with other law firms are surprised by the level of communication and transparency they receive from our office. You will have complete access to your attorney and you will have the ability to speak with them about your car accident at any time. "I want to thank Mr. Matt Fleishman and his staff for their professionalism, care,and guidance I received while being represented in a personal injury case. Mr. Fleishman was able to explain the litigation process in a manner that was calming, precise, with all viable options outlined with examples I could understand. The lines of communication were always open therefore enabling me to seek guidance at anytime during my case. It is because of Mr. Fleishman and his staff that I was able to concentrate on getting better rather than worry about how to navigate insurance companies and health agencies. It is without reservation that I recommend Rosensteel Fleishman Attorneys at Law." At Rosensteel Fleishman, PLLC our Charlotte personal injury lawyers handle every aspect of your car accident (or other personal injury) from start to finish. Our lawyers have handled personal injury cases all over North Carolina and are regularly brought in to assist other lawyers with their client's cases. It is not without a small amount of pride that we continue to serve thousands of people across NC despite the fact that we have never advertised our services via TV, radio or send letters to people's houses.